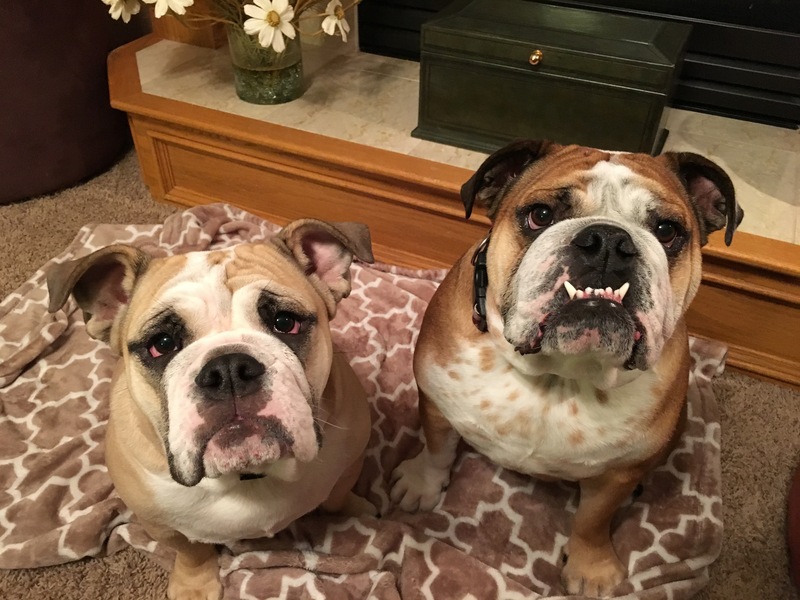 Seven-month-old English Bulldog female Billy (left), lives with two-year-old Huey (right), also an EB. Their guardian asked me to put a stop to Huey’s nervous behavior (being clingy, pacing, barking and rarely laying down) as well as improve his respect and obedience for them as authority figures. It didn’t take long to see that these dogs didn’t see humans as authority figures. When we allow dogs to get in between us and the door when we are answering it, and the dogs are in an excited state, you have a bad combination. To dogs, whoever is in front is literally in the leading position. Because the guardians didn’t claim the space around the door or send the dogs away before opening it, they had lost the battle before it started. In the future it will be important that the guardians claim the area around the door when visitors arrive and communicate to the dogs that they are to stay behind a boundary until called for before they open the door or let guests in. Taking control in this way will go a long ways towards positively effecting the dog’s behavior when future guests arrive. I sat down with the dog’s guardians to start discussing what they wanted to get out of the session when Huey decided to show me himself. Often times I’m called in to help dogs stop doing things that they know that they’re not supposed to do. That wasn’t the case here. It was obvious to see that these dogs absolutely considered everyone completely equal in terms of authority. As a result they were pretty much doing anything that they felt like doing. Usually I like to sit down and ask the clients what they want help with, but in this situation it was pretty clear. Making the couch off-limits is going to be a bit of a struggle for the first few days. But now that the guardians know how to communicate using body language and have a appropriate consequence to apply when the dogs fail to listen, it shouldn’t take long before they start to see a literal difference between the human and their authority. In the course of my discussion with the dog’s guardians, I learned that they were doing a lot of communicating verbally as well as shoving the dogs away when it jumped up or got too close. To help the guardians communicate more effectively with their dogs, I went over a set of escalating consequences that they can apply when the dogs refuse to listen. It’s going to be important for the dog’s guardians to employ these new escalating consequences with good timing whenever the dog gets into trouble or breaks a rule. If they can do that consistently over the course of a week or two, these new communication methods will become second nature to them. Once that’s the case, the dogs will fall into line faster and the humans will need to use fewer escalating consequences. Eventually the guardians should should be able to disagree or correct unwanted actions or behaviors with a simple hiss. It was great to see how quickly the guardians picked things up. While I was coaching them on the details of the various techniques, I noticed that the dogs were already starting to see and respond to them as authority figures. A couple of minutes later, someone passed by the front of the house and Huey caught a glimpse of them through a window. His first communication was to lower his head slightly and stare at the passerby to disagree. Not getting the reaction that he wanted, Huey took things to the next level by emitting a low growl. If something wasn’t done quickly I know that things would become more intense so I showed his guardians how to disagree and put a stop to it before it really got a chance to start. I’ve worked with a number of English Bulldogs in my career and I have to say, this is the most excepting and well mannered pair that I’ve ever met. Usually they are textbook examples of determination, but these dogs clearly want to please. This was not a situation of bad dogs, this was a situation of dogs and humans not being on the same page. Now that the guardians were communicating to the dogs exactly what they wanted in a way that the dogs understood, the dog’s behavior improved dramatically. Huey’s pacing had stopped completely and he was easily distracted from reacting to things he used to bark at. The dogs were respecting a cushion of personal space around all the humans, had stopped trying to get up on the couch and were following commands immediately. Even their energy levels had dropped a bit which helped everyone relax. While I was very happy to see how quickly the dogs adapted, I was even prouder of how well the humans did. They started adopting the new techniques almost immediately end towards the end of the session were getting quite proficient at them. If they continue to use them as they did during the session, it shouldn’t take long for Billy and Huey’s unwanted behaviors to be stopped for good.